It’s been a busy couple months for Nutritional High (CSE: EAT). Since the start of September, they have signed agreements with a number of companies. Some of these agreements have been addressed in our other articles, such as the Canada House Wellness joint venture, or the Isodiol International’s Pot-O-Coffee distribution agreement. Others have not been address as a result of them being private companies. As a result of Nutritional High making its presence known so frequently lately, we decided to compile their latest agreements into a single post. Hopefully, this will make things a bit easier to access for those of whom are interesting in knowing more about this small cap company. On September 6, 2017 Nutritional High announced that it was finally entering the Californian market. To do so, it entered into a purchase agreement for a 9,000 square foot facility. The facility is located in Northern California, and reportedly meets all licensing requirements. The deal is contingent on the company acquiring all required licenses related to that of its intended use. Nutritional High indicates that the purpose of the facility will be for cannabis oil extraction. It will additionally manufacture cannabis infused products, under the FLI line. It expects to be operation in early 2018, once the Californian licensing system is established for cannabis facilities. Financial details related to this acquisition were not released by Nutritional High. Additionally, due to the latest financials not being filed yet, it will be a short while yet before we can get an understanding of the total expense related to this facility. Details were scarce. On November 1, 2017, it was announced that Nutritional High had submitted for a permit from the City of Sacramento, California. Upon the completion of this, it will also submit to the state of California for a license to manufacture products. 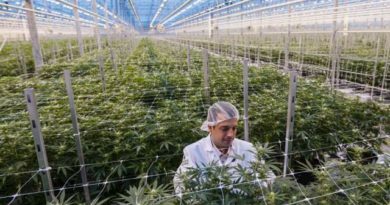 Looking to establish itself in the Canadian marketplace for cannabis products, on October 17 it was announced that Nutritional High and Canada House Wellness had signed a letter of intent to enter a joint venture. The purpose behind it essentially, is for Nutritional High to have access to the Canadian market, and for Canada House Wellness to have direct access to cannabis oils and infused products. Under the terms of the agreement, all expenses are to be covered by Nutritional High. In exchange for this, 2,000 square feet of the licensed Abba Medix facility in Pickering, Ontario will be allocated for the joint venture. The purpose of the facility will be for cannabis oil extraction, as well as for cannabis infusion into products. With regards to the products manufactured, there will be two separate lines. The first, will be under the Canada House Wellness brand. These will be marketed primarily to the company’s vertically integrated clinics and their patients. There is future plans for this product line to be also sold to recreational users once legislation is in place. The second product line will be that of Nutritional High’s FLI product portfolio. This line will also be marketed to Canada House’s client base, as well as to recreational users across Canada. Regarding the financing of the venture, as was previously stated all costs are to be born by Nutritional High. This includes the rental costs for the facility, and any establishment costs associated with the joint venture. Additionally, Nutritional High will share it’s FLI product formulations with that of Abba Medix, a subsidiary of Canada House. The make up of the joint venture will be a 50/50 split, however there will be an accelerated return for Nutritional High until the establishment costs are repaid in full. There were no hard numbers given regarding estimated costs to establish the facility. On October 30, 2017 it was announced that Nutritional High was expanding its FLI product line to Washington state. In order to do so, it had entered into a three year lease agreement for a 7,800 square foot property. The facility on this property is suited for the use of cannabis. It is fully integrateable for the purpose of growing, extracting, and manufacturing cannabis related products. Currently, the tenant in the space is Mt. Baker Greeneries, whom Nutritional High has also partnered with. As per the terms of the agreement, Mt. Baker Greeneries will sublet the space from that of Nutritional High. In return, the company will provide its proprietary FLI product formulations for production within the facility. It is expected that within a time frame of six months, Mt. Baker Greeneries will be prepared to commence the sale of the FLI branded products. As an added benefit, the company is already licensed for the growth and cultivation of cannabis products by the state of Washington. This enables a quick turn around time once product formulations are received from Nutritional High. Similar to the other recent agreements, no financials related to the transaction were released, aside from the price at which the facility can be purchased after three years – $1.2 million. Nutritional High started the month of November off on a high note. On the first of the month, it issued a joint release with Isodiol International, indicating that a distribution agreement had been signed. As per the agreement, Nutritional High was recruited to distribute the Pot-O-Coffee brand in the states of Colorado, Washington, Illinois, California and Oregon. The reasoning behind this agreement, is that essentially Isodiol was in need of a partner in each state. As a result of current legal issues in the United States, cannabis products cannot cross state lines. Cannabis may be legal in the individual states, however federally it is illegal. This is the reason that Nutritional High has so many separate operations in different states, because the products cannot be shipped past each states borders. As such, due to Nutritional High having subsidiaries in each of these states, it is beneficial for companies like Isodiol to partner with them. Rather than partner with an individual company in each state, Isodiol is able to partner with just one company that spans five states. This makes it significantly easier from a logistical standpoint, and is a competitive advantage harboured by Nutritional High. Therefore as per the agreement with Isodiol, Nutritional High will perform the final manufacturing step that infuses the cannabis in to Isodiol’s Pot-O-Coffee product lines. Nutritional High is then responsible for the distribution of the product as well within these states. All sales will then be subject to a royalty payable to Isodiol International. The royalty fee was not disclosed in the news release. Continuing its rush of news releases, on November 7 it was announced that Nutritional High had inked a letter of intent to acquire Calyx Brands. Calyx Brands is a cannabis distributor that provides product to legal dispensaries in the state of California. The acquisition will further strengthen Nutritional High’s new position in the Californian market. Under the terms of the agreement, Nutritional High will acquire 100% of Calyx Brands. The company currently acts as the middleman between licensed producers and licensed sellers of cannabis products. Furthermore, it carefully tracks the data related to sales performance at each dispensary, and provides information on how producers can better improve their sales. This will be beneficial information upon commencement of recreational use legislation on January 1, 2018. The additional strategic benefit behind this acquisition is related to Nutritional High’s own brands. By purchasing the distributor of cannabis products in the region, it enables itself to easily integrate its own product lines into Calyx Brands offerings, thereby creating instant, efficient sales channels for its products. No financial information was released related to the acquisition. Further to this agreement, on November 14 it was announced that Nutritional High had sourced a manufacturer in California for its FLI concentrates. Referred to as “vape cartridges” this premium product will be manufactured by an undisclosed entity. They will then be distributed by Calyx Brands for Nutritional High. No financials were released related to the manufacturing of these products. Before the ink had finished drying on the Calyx Brands letter of intent, Nutritional High had signed an agreement with Xanthic Biopharma Ltd. Xanthic is a life sciences organization based out of Ontario. Their focus is on the creation of products infused with CBD as well as THC. Under the terms of this agreement, Nutritional High will manufacture and distribute Xanthic’s current product line in the state of Colorado. This product line currently consists of three products – a CBD based sports drink, CBD based fruit drinks, and a CBD solution that assists with a THC overdose. All three of these come in a powdered form, as an alternative to current product offerings on the market. It is also expected that these products will at some point in the future be introduced to the other states that Nutritional High operates within. Furthermore, an additional twelve more products created by Xanthic will potentially be manufactured and distributed by Nutritional High. Although not explicitly stated, this is likely dependent on the success of the first phase of the agreement. By now, you should have noticed a common denominator. If not, we failed to make it clear to you and that’s on us. None of these news releases contain anything related to the financial aspects of these transactions. Numbers wise, the most information we received was the purchase price of a facility that Nutritional High is currently leasing. In estimate terms, the most we received was that the company would be funding all costs related to a potential joint venture. Shareholders weren’t even given the royalty fee for a distribution agreement. This is a problem. Transaction costs should be provided to shareholders for transparency reasons. Its how the market can determine if a deal is outstanding, or if it is lousy. For example, lets look at the Isodiol deal quickly. What would your reaction be if the royalty fee for each sale was 2%? What about 20%? 30%? Your reaction would likely be very different for each scenario. An agreement cannot be sufficiently analyzed without some form of financial information. For now, investors are left waiting until the latest financial statements are released. The company is due to release its audited financial statements by the end of November for the year ending July 31, 2017. We should be able to find sufficient information to judge these deals under the “subsequent events” section of the report near the bottom. Until then, shareholders don’t know if they inked very favourable terms, or real stinkers. Focus on the details. Analyze all the reports. Dive deep. Information for this analysis was found via Sedar, Nutritional High, Isodiol International, Canada House Wellness, and Calyx Brands. The author has no securities or affiliations related to this organization. Not a recommendation to buy or sell. Always do additional research and consult a professional before purchasing a security.